Swansea born actress Cara Readle, famous for her role in ‘The Story of Tracy Beaker’, will be taking on a duathlon on 20th August to raise money for Cerebra. The 27 year-old, who was born with Cerebral Palsy, has been an Ambassador for us for several years and has never let anything stand in her way. Back in 2014, she completed a 2 mile walk in Mumbles from Black Pill to Verdi’s – a huge achievement. As well as having many acting credits to her name already, Cara also graduated from the University of Wales Trinity Saint David with first degree honours in Performing Arts. 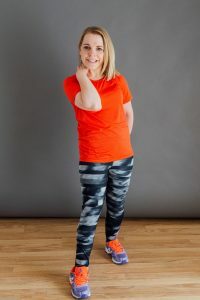 Cara’s latest challenge will see her embarking on a 5km walk on a treadmill and a 5km cycle on a static bike, all taking part over the course of a day at Xcercise4less gym in Swansea. Cara took time out of her busy training schedule on Wednesday 25th July to draw the winners for Cerebra’s summer raffle. Cerebra staff got in to the spirit of the occasion by dressing in their best workout gear! You can sponsor Cara through her Just Giving page.